It was assumed that there is no market for spy software for Blackberry Smartphones running on OS 10.
it is clear that Blackberry is providing developers – Background Services framework which allows developers to bundle a separate process with their application to run in the background without a UI. It means that apps will no longer require an Active Frame to be open in order to function, That’s what we need to have a spy software. I am going to try my hands on above certainly… keep an eye..!! Categories: BB10 | Tags: 10, BB 10 Spy Software, Blackberry, Blackberry 10 headless apps, Software, Spy, Spy App BB 10, spy software Blackberry 10 | Permalink. This is a sample project to explain about multi level list views in our BB 10 Cascades project. I have used some static JSON files which are bundled inside the project as assets. ListViews displayed here are list of albums, list of songs under an album, and details of a song. This project do not use C++ files for accessing assets, parsing JSON data and populate them at runtime in Screens using QML Only. MyListItem – Used as List Item for First Level ListView. Also, you can download the project from here and “Import”->Existing Projects into Workspace->Select archive file->Check Project->Finish. Categories: BB10, BlackBerry | Tags: BB10 Cascades ListView example code, BB10 ListView, Multilevel List BB10, Multilevel ListView Example Cascades | Permalink. “Your account – Gmail – user@domain.com – user@domain.com cannot be authenticated with your service provider. While looking up for the problem, I found a solution that involves setting my account up as an Active Sync account.It will provide all the awesome functionality like Google services back up and running. 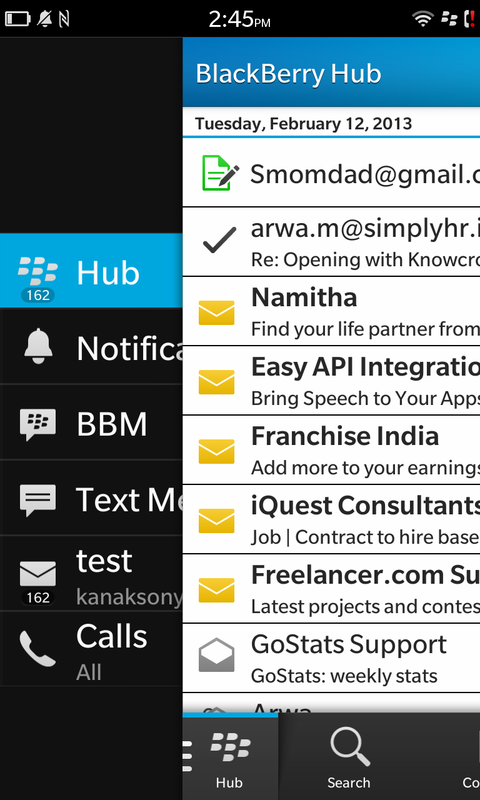 Categories: BlackBerry | Tags: Configure Gmail Account in Blackberry 10, google account blackberry 10, problem setting gmail account ob blackberry, Setting up gmail account on blackberry 10, setup gmail account on blackberry 10 | Permalink. Basically, we need a Client-Side Application tolisten for Push Messages and a Server-side Application to fire Push Messages. Categories: BlackBerry, Software Development | Tags: Blackberry PPG Base URL, Blackberry Push Client, Blackberry Push Sample Code, Blackberry Push Server Client, Blackberry Push Technology, http://cpxxx.pushapi.eval.blackberry.com | Permalink. After a long time, I am back with lots of things to share.. As being an Indian I love sweets and so will like to Shri Ganesh with some delicious experience..!! Registration – I registered for the event, and was very curious to explore the BB10 insights. Also, I have applied for the most awaiting and game changing BB10 Dev alpha Device. Qualified for BB 10 DEV Alpha Device – I was at office on my desk wrapping up all the tasks, as I was on leave tomorrow and today lots of things were to finish. Suddenly, I checked my mail and was cheered up to have a mail from RIM (4:51 PM) mentioning, that I have been qualified for the device. It was so special when everybody in my office started congratulating me for this..!! Event was kick started by Sarim Aziz, Head of Developers Relations, Asia Pacific RIM. Annie Mathew, Head of Alliances for India highlighted the important contribution of thousands of Indian developers to build apps for entire globe. Alec Saunders then took the stage after an amazing number, and the energy in the room went boom..!! Krishnadeep Baruah, RIM India’s Head of Marketing, who took the devs through the BlackBerry 10 UX and Next, Alan Wong giving the audience a taste of the BlackBerry 10 architecture. It wasn’t just talk, as Alan showcased some interesting demos and samples. It was a whole day event and was quite interesting to have some wonderful facts..!! It was an excellent event. Thanks RIM for organizing such events..!! Categories: BlackBerry, Software Development | Tags: BB 10, BB 10 JAM Delhi, BB event, Blackberry 10 Dev Alpha, Blackberry 10 JAM Delhi, Blackberry Event | Permalink. Categories: Great Personalities | Tags: Chanakya management, Chanakya Neeti, Chanakya quotes, Chanakya sutras | Permalink. Above factors are influencing, but in my opinion these stands lower to some other factors if ranked. (2.) Recognition of Achievement – “We are recognized and appreciated when we do a good job or suggest any new idea”. (3.) Pride – We are pride to be a part of the organization. (1.) Break the gap. Talk to your people!! (3.) There is no problem in getting little personnel. Discuss their personal good and bad events. We all are humans and everyone see light and dark. (4.) Help them in getting successful, not pulling them down. Failure of employees in their duties is definitely failure for the company itself..!! These factors can make employees walk with you extra miles over and over!! Categories: Motivation | Tags: motivate employees, motivation | Permalink.